I've had whoopie pies on the brain lately. I made these cream-filled cakey sandwich cookies for the first time almost a year ago, and since then the urge to make them has crept back up on me slowly and steadily until I could ignore it no more. I've had some good whoopie pies and some mediocre ones recently, but nothing has come close to my first attempt, pumpkin whoopie pies. These little red velvet guys were a fun variation on the theme, and the flavor was spot-on, but I tragically overbaked them. The texture wound up a bit on the dry side, crumbly and really messy/difficult to eat. 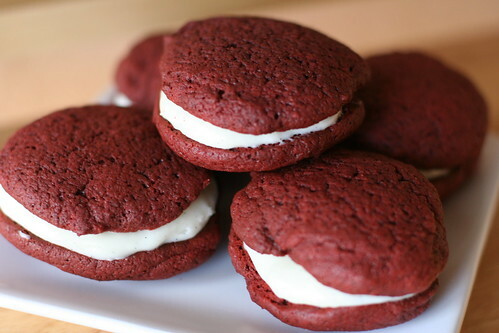 A good whoopie pie should be moist and dense, the perfect cross between cake and cookie. Despite my less-than-perfect red velvet experiment, I am undeterred! Next on my list to try is chocolate peanut butter. What's the best whoopie pie you've ever had? 1. Make the cookies: Preheat the oven to 375 degrees F. Line 2 large baking sheets with parchment paper. Combine the semisweet and milk chocolate in a microwave-safe bowl and microwave at 50 percent power until melted, about 2 minutes. Whisk until smooth. 2. Whisk the melted butter, sour cream, eggs, vinegar, vanilla and food coloring in a bowl until combined. In another bowl, whisk the flour, sugar, cocoa powder, baking powder, baking soda and salt. 3. Add the flour mixture to the butter mixture in four equal batches, whisking each batch completely before adding the next. Stir in the melted chocolate. 4. Scoop heaping tablespoonfuls of batter onto the prepared baking sheets and smooth the tops with a damp finger. Bake until the cookies spring back when lightly pressed, 8 to 10 minutes. Let cool 10 minutes on the baking sheets, then transfer to racks to cool completely. 5. Meanwhile, make the filling: Beat the cream cheese and butter with a mixer until smooth. Beat in the confectioners' sugar and vanilla seeds. Sandwich a heaping tablespoonful of filling between 2 cookies; repeat with the remaining cookies and filling. Refrigerate 30 minutes before serving. How did I not know your blog before? !